Tex-Mex has long been a Metroplex staple. From chips and queso to enchiladas and fajitas, Texans can’t get enough. I think most would agree that one of the mainstays of great Tex-Mex is the always versatile taco. Breakfast, lunch, or dinner, tacos can be made in hundreds of ways with a multitude of ingredients. In downtown Arlington, an area that has seen exponential expansion over the past decade, new businesses, bars and restaurants are sprouting up on the reg. One of those new additions is Cartel Taco Bar. 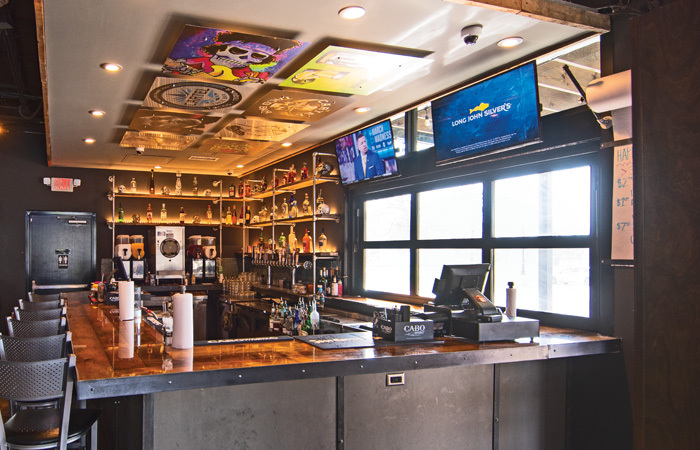 Nestled in the same development as Legal Draft Beer Company, this hip taco shop features apps and tacos that are truly next level, as well as a tequila selection that will definitely let the good times roll. Cartel features a smaller, simple menu, but the bold flavors will knock your socks off. If it’s a sharable you’re in the market for, perhaps to get some food on your stomach before a night of cocktails, then look no further than the appetizers on the menu. Of course, usual suspects like nachos and chicken quesadillas are a traditional standby for those looking for a quick bite, but if you really want to take things up a notch – go for the queso – which comes with traditional chips as well as a Cartel twist that is sure to become your new addiction. Crunchy chicharrons also adorn the platter and believe me, you will never enjoy queso so much. And hey, if you’re one of these trendy Keto diet people, the crispy pork skins are perfect to satisfy your queso craving without deep-sixing your daily carb intake. Another app that is unlike anything you may have ever tried are the Fire Stix. These are similar to traditional mozzarella cheese sticks with a twist. Rather than mozz, these stix are stuffed with pepper jack cheese to add some spice. They’re then rolled in a combination of panko breadcrumbs and crushed red and blue corn tortilla chips. They’re perfect to split as an app and filling enough to eat by yourself as a meal. Seven Layer Dip is a traditional party favorite, but you won’t find it on many menus when you’re out for the evening. Cartel’s version comes in a warm skillet and is served with chips for dipping. Refried beans, nacho meat, cheddar, black olives, jalapeno and sour cream layer to make this a fantastic dish for splitting among your group. 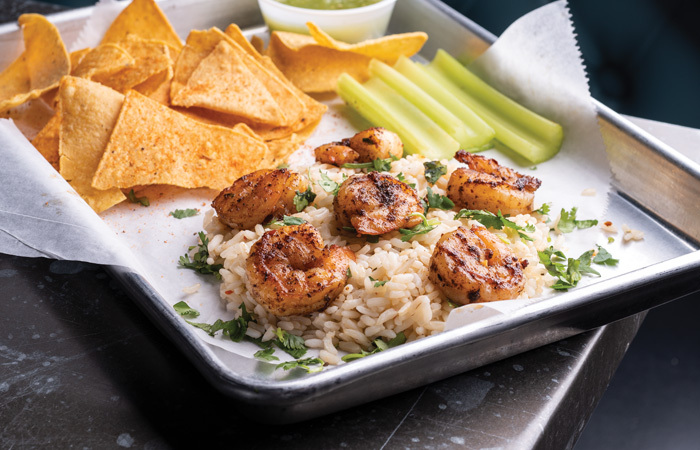 If you’re looking for something on the healthier side, the Cartel Shrimp Bowl or the Chop Salad might be up your alley. The bowl features Cilantro rice with shrimp sautéed in Cartel Butter, sprinkled with Cotija Cheese and served with chips. The shrimp were perfectly cooked, and the Cartel butter adds some richness. The Chop Salad comes with an Iceberg Romaine blend, topped with blackened chicken, Cheddar, black bean salsa, Cotija cheese, and is topped with Italian Verde dressing and tortilla strips for some crunch. Of course, we couldn’t talk about a taco bar without mentioning the selection of tacos at Cartel. 10 different options can be served on a corn or flour tortilla, or for those wanting to cut the carbs, as a lettuce wrap. For those looking for traditional, the #1 is a great choice. Choose fajita chicken or beef which is then prepared with bourbon bacon beans, Pepper Jack, smoked tomato and a creamy Avocado Aioli, Sour Cream, Cilantro and Onion. It’s a great spin on the classic fajita. If you’re looking for something more exotic, the #10 might be the way to go. The Barbacoa is topped with shredded Ghost Pepper cheese, Mexican rice, sautéed onion, mushrooms and Grape Tomato topped with Cartel butter and a fantastic Smoked Tomato Aioli. Cartel’s menu is definitely unique, but the most interesting taco innovation by menu creator Paul Checkeye has to be the Blackened Chicken Taco. 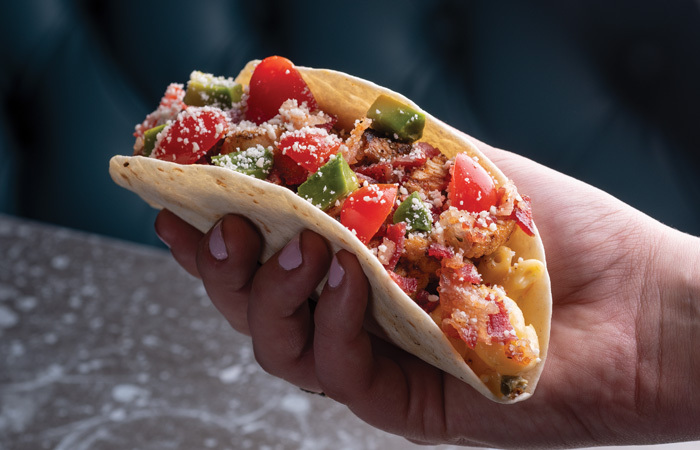 The chicken is topped with Kentucky Bourbon Bacon, Avocado, Grape Tomato, Cotija Cheese and one not-so-Tex-Mex ingredient… smoked five pepper mac n’ cheese. That’s correct, the taco has mac n’ cheese on it. It may sound psychotic, but it’s delicious and unlike anything you’ve ever tried. It’s a must-order if you’re making your inaugural run through Cartel. If you’re looking for street tacos, Cartel has those too, and they are just as delicious. In addition to the great food and drink, check out Cartel’s “Under the Skull” music series which features local artists performing acoustic sets on Friday and Saturday nights. Unique food, unique drinks and a unique atmosphere make Cartel a must try whether you’re headed to Arlington for a game, or just interested in the next evolution of the taco.